Black bean or any other kind of soup, there’s nothing better in the winter than a big bowl of soup, right? The Accidental Locavore loves soup, thick and chunky, however almost anything hot will do when the temperature drops. 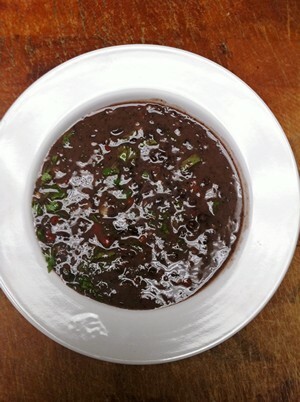 And while there are soups like French onion, that take a long time, there are a lot of great quick soups like this black bean soup, that will really hit the spot in no time. The corn and bacon chowder on the site is quick, I just made a batch for a friend that doesn’t eat pork, using a small chipotle and some sauce for that smoky flavor (and an little heat), so it was vegetarian, if not vegan (milk and some butter but you could use olive oil) and really delicious. Today I did a super easy black bean soup that is vegan, but don’t hold that against it! It’s from John Hagianis, who had a local restaurant and relocated to the midwest. He left us the recipe to remember them by. This will make 4 generous servings. It’s a pretty free-form recipe, so feel free to add or subtract according to taste. Olive oil to coat the bottom of the pan. Use good but not great oil. Heat the oil in the bottom of a saucepan over medium heat. Add the garlic, and let it cook for a minute or two to flavor the oil. Add the red pepper, the jalapeno, the beans and the liquid from the cans, the cilantro, and a splash of red wine vinegar. Add the cumin, oregano, salt and pepper, stir, taste for seasonings and adjust to suit your taste. Bring to a boil, and cook for 5 minutes. Serve and enjoy. I stuck an immersion blender in the soup for about 30 seconds to puree it a bit to thicken it, but you certainly don’t need to. You can serve it with a dollop of sour cream, some cilantro, and croutons for embellishments. This looks easy, delicious and oh so healthful. Perfect for the post holiday DETOX SEASON. The photo alone is sending me off to the grocery store for the ingredients. Blogging Boomers Carnival No. 191!